I'm brand new to the forum and new to the world of Huskies! On Wednesday my kids and I went out to checkout a litter and we feel in love of course. We picked out this sweet little guy who we're naming Bear. Unfortunately we are going on a week long vacation and can't bring him home yet. The breeder is kind enough to keep him until we get back. He's 9 weeks and weighed in at 14.6 lbs if I remember correctly. Wednesday when we first met him. 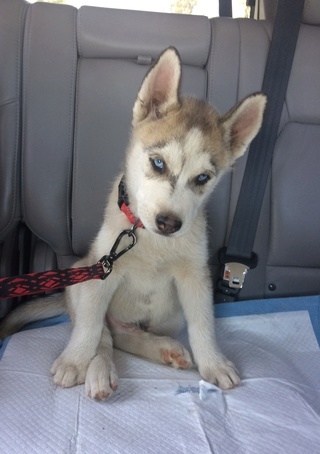 Yesterday when we drove back out to take him for his shots & microchip. Ah, he's a cutey - but then all puppies are cute!! 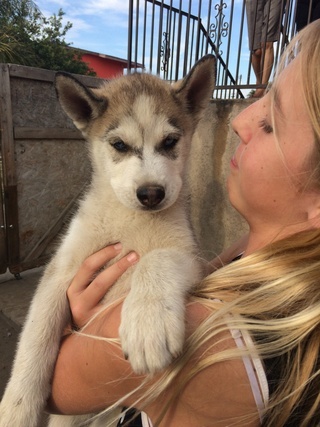 Welcome to the world of Husky madness - you'll be wondering why you did it in a few months and wondering, at the same time, how you could ever do without him! Yep, they're addicting - I have three! First pic: Uh, who are you?? Second pic: Yeh, I'm cute! I know it! Third pic: I'm okay, but this table is cold! Surprisingly he looks comfortable at the vets. Thanks for the welcome! 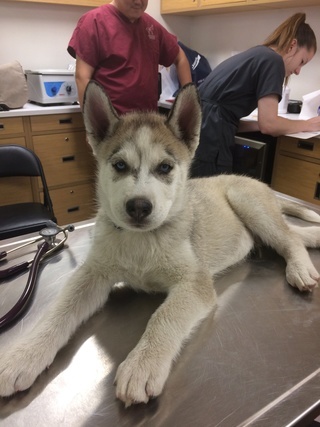 He was quite calm at the vet. I think he was more scared than comfortable though. Poor thing. By the end of our little field trip with him he was passed out! Welcome to the forum. Cute pup. Fun times ahead. Glad the breeder was willing to hold him while you go on vacation. Once you get back, the work begins. Very cute, congratulations! Welcome to the forum. welcome to the forums. congratulations on your cut fur baby. Thank you for the kind welcome everyone. I can't wait to get back and bring him home. I am apprehensive about all the work ahead but also excited to bring him into our family!